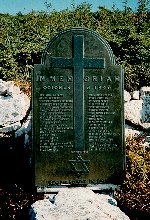 The worst plane crash that occurred while the Harmon Field Base existed was the unforgettable tragedy of 1946. It was, at the time, called history's worst air crash. On October 3rd, just minutes after takeoff from Harmon Field, a New York-to-Berlin airliner rammed into the fog-hidden Newfoundland mountainside, and exploded into flames, just 7.5 kilometers from the end of the runway. The flames burned fiercely for several hours. Rescue parties fought their way to the scene. They reported that the plane was gutted by fire, and there were no signs of life. The crash took thirty-nine lives. Hare Mountain has since been renamed Crash Hill. Crash Hill graveyard, on the side of Crash Hill, 7.5 k northeast from the end of Harmon Field. Victims of the crash included six children ranging from three months to 11 years. Most of the men, women, and children were on their way to reunions which would have taken place in Germany. Among those in the crash, was a man from Southern California, Alva J. Marley, who was on his way to Germany, planning a three-year stay as a technician for the Coca Cola Bottling Company. In July of '89, three American children of the late Alva J. Marley put to rest some questions that always were unanswered. With the assistance of the 103 Rescue Unit based in Gander, Newfoundland, three of the family members, along with Francis Walsh a resident of Stephenville, had the opportunity to visit the crash site. Dixie, Marley's daughter says, "The first knowledge the family had of the crash was when they were awakened by the doorbell at 6:30 a.m. ( California time ) by a news reporter asking for a picture of Marley to run in the paper with the news of the crash. The news had come on the radio during the night, but the family had been in bed and had not heard it." Marley's wife, Mabel, was in shock for quite some time and when she was offered to fly her and family to Newfoundland to the services held in a plane over the site, she refused to go. The visit to Crash Hill brought back many memories for everyone. The following spring, one portion of the mountain was blasted to cover up what had been left of the wreckage. 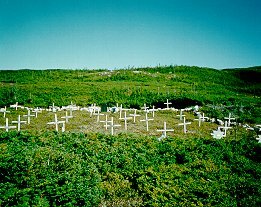 The graveyard, with thirty-nine white crosses and a brass plaque, on the top of the hill, is the only evidence of the plane crash. Over the years the gravesite had received some damage by the elements; Some crosses had fallen down, and some were covered by moss which clings to the rock at the location. The 43 years had taken its toll on the deterioring wooden crosses, so it was time for the site to be fixed up. Maj. Grant Smith and his unit decided they would refurbish the crash site. The crew worked for three days reconstructing the gravesite as close to its pristine condition as it could possibly get. All new crosses were made. Nameplates on the old crosses were all retrieved and attached to the new crosses. Even today some feel the crash to be somewhat of a mystery. Some say they may have taken the wrong circle leaving the base, but whatever the case may be, the site is at final rest. Many now have accepted their losses. Family members seem relieved their loved one's final resting place is in a setting of such tranquility. Some even take comfort in knowing death came quickly and there had been no suffering; but to those who lost their lives may your memory always be with us.